Today I am low on pictures and projects! I seem to be very busy lately and my crafting time has been limited. It is all good. I have put down the needle and thread and just hung out with my dear children a few nights. Other nights they are in sports and all the other things that keep us busy in life. I have made a resolution to only start new projects if they are necessary until I have checked off some from my current Work In Progress (WIP) list. However, my version of necessary must be a little loose because I have added two new projects since making my resolution, ha. In my previous editions of WIP Wednesday I have limited my lists, I am not sure why. Today I am going to attempt to list everything that I have started and need to finish! I did complete a project, but only because I changed directions with it. 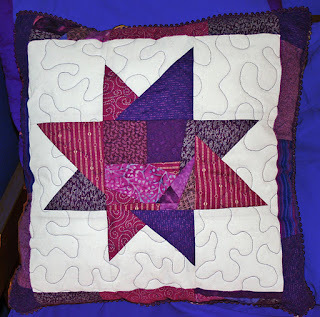 First I started with a scrappy square, then a week or two went by and it became a star, last week it made its final transformation and became a pillow. I decided I should practice my free motion quilting, plus I had a small amount of purple minky dot that matched perfectly with my scrap fabric. Perfect for the back of the pillow. I love it. It is on my daughter's bed right now, but I think it would look better on my bed. We will have to figure it out. I may attempt better pictures of it in my bedroom soon. Plain Spoken Quilt - The final arrangement is made and I have all my rows sewn and 5 of them together. Farmer's Wife - I have a couple more blocks done. I will share later this week. Nearly Hexagon Charm Quilt - I have about 750 hexies done. I am in a swap right now and I need the fabric in order to continue. I think when it is all said and done I may be 100 fabrics short. I will have to figure this out! Terrain Wall Hanging - I have been working on the plans for this one in my head. I have a habit of starting projects without having the full picture in my head. I find it exciting as it comes together. Master Bedroom Curtains - I have curtains that I almost like, I need to rework them. Slipcover For Playroom Couch - I started, but have not finished. I really need to do this. 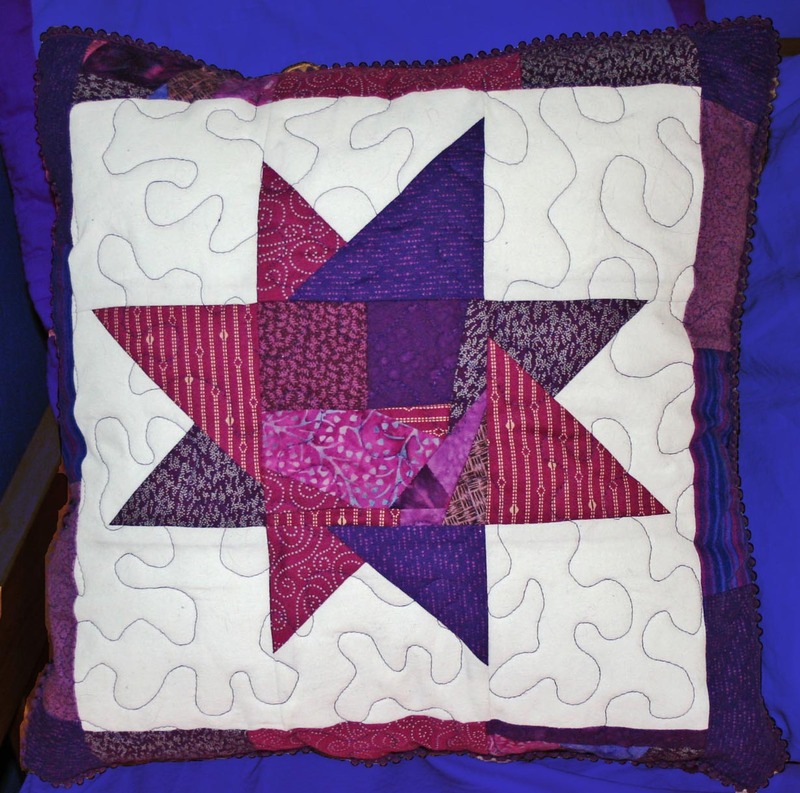 Rag Quilt - I started this November 2010. I am over 1/2 way done. Wedding Gift - This will be matching pillows. Knit Hat - should be interesting as I am a complete beginner. Other necessary items that my family needs.